The Heritage Glen Hyper-Lyte is a modest size fifth wheel that has a length of 34 ft., weight of 7915 Lbs., with a hitch weight of 1552 Lbs. This unit can sleep up to 8 people. 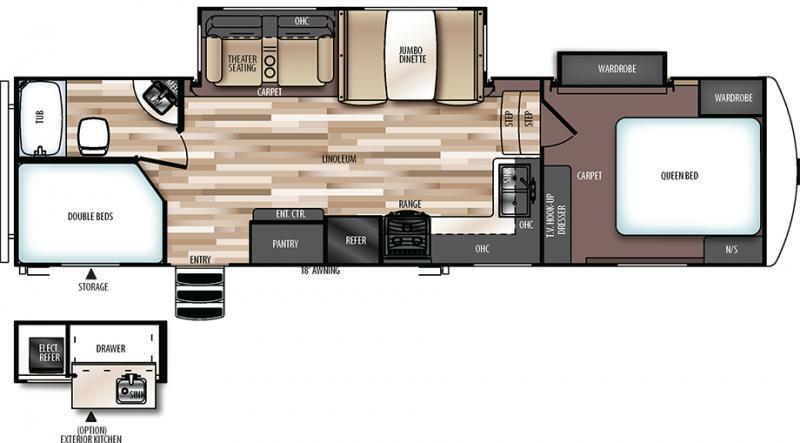 The 28BHHL has an outside kitchen which includes a bumper mounted grill, sink with drain, refrigerator and drawer. The 18 ft. power awning with LED lights under awning gives you great protection and comfort. This unit also comes with the extreme weather package. ² While every attempt has been made to ensure the accuracy of the datadisplayed, Northtown Motor Homes, Inc. is not responsible for any errors or omissions. Copyright © 2019 North Town Motor Homes. All rights reserved.